All the space you need, plus a few bells and whistles. The Banjo Brothers Deluxe Seat Bag is available in three sizes, so you can pack repair essentials, snacks, or a mini pump. The Medium size even features a cool pop-out expander for a little extra room when needed (a design proven by the classic 1960's VW bus). The tough 1680 denier ballistic nylon fabric fights off the wet weather and wears like iron, plus water proof zippers prevent leaks. Three interior pockets keep cargo organized and fragile items like tubes protected. A key leash has also been placed inside, and reflective piping on the outside keeps you seen after the sun sets. Webbing tab for safety light attachment (light not included). Simple strap attachment. I planned to ride a century but didn't want to depend on rest stop food offerings (certain foods just don't settle after mile 50). I stuffed my jersey pockets but looked like a deflated Michelin Man. So I ignored Rule 31 and purchased this European Man Satchel. It's big, swallowed everything I dared dump in it, but cinches up nicely and is barely visible under my Selle Italia Flite. 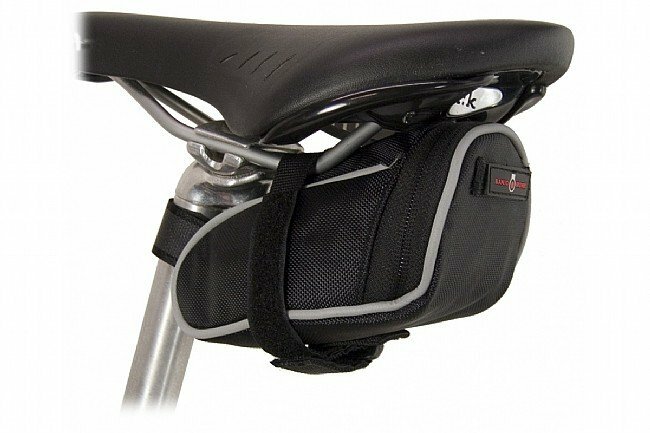 Of course any seat bag is an abomination. But this one is a useful abomination. And my Jersey mainted it's sleek, aero, Ero-pro look (or at least what was possible given the body it was draped over). What more could you want? Use it to store tire repair equip. I got the small bag and can fit 1 tube, CO2 cannister, CO2 Inflator, small multitool, tiny patch kit, and thin business card holder I use to carry my cash, local trail pass, a credit cardhealth ID card. Tight fit, but now my jersey pockets are free for smart phone, foodgels, spare CO2 cannister or second tube for long rides, or room for clothes I peel off during colder rides. It's slightly smaller than a bag I used before. Well made and has a good shape to it. There is no inner compartments to divide things, but it does have a small clasp on a tether to secure a key. I use this on my road bike and mtn bike, though i'ts a little too small for mtn biking because the larger inner tube barely fits. The reflective piping is good. The two interior side pockets are worthless and just take up space. They do not close, and they are open sideways toward the rear of the bag, so stuff can easily fall out when you open the bag - I don't see the point in having them. The loop at the back is okay, though my clip light has fallen off several times when going over bumps. There is a 5 inch or so strap with a clip inside the for car fobkeys - but this is sort of a useless feature - I feel they are trying too hard to add bells and whistles by including the key strap and interior pockets. The velcro strap is very secure but somewhat difficult to take off and on to switch to another bike. I may yet cut out the interior pockets and key strap to make it more functional. On first opening the box, my reaction was this bag is too small to even hold a tube- just ship it back. But with a little patience I worked in a tube, tire irons, a CO2 cartridge and an allen wrench set in the size small bag. So the bag is big enough for what you need to change a flat or make minor repairs on the road, anything else put in the jersey pockets- that's what they are there for. perfect size if you get the medium. fits a spare tube, tire levers, co2 applicator/canister, emergency spoke kit, tire boot, patch kit, multi-tool AND a pocket knife. you'll be the most prepared cat on the road-plus it looks great at night. The materials and craftsmanship on this bag are very good, so I expect to get a lot of miles out of it. Reflective accents are a nice safety feature, as is the sewn-on loop that enables you to latch a blinkie light on the back. I bought the medium, and it's almost got too much cargo space. I stash 2 CO2 cartridges, air chuck, tire levers, and a multi-tool and still have room for at least one tube. The materials and construction of this bag are clearly high quality, so I expect it hold up well over time. Reflective accents are a nice additional safety feature for low-light riding conditions. I bought the medium bag, and it's probably a tad too big-I can stuff three CO2 cartridges, airchuck, tire levers, and a multitool and still have excess room in the bag. Most seat bags are too small or too large. The mini is the perfect size for my needs. It has three compartments. In the center I have a 700x23 tube, left a 16g co2, right is a folding park chain tool. In the pocket of the zippered door I have a Park glueless patch kit and a spare Wipperman Connex link. I place a spoke wrench on the top of the other junk (not in a pocket) and zip up the door. This stuff is just for emergency. I pack most my stuff in my jersey pockets. Held on by two velcro straps, no need for a strap for the seatpost. No rattles. Well made. I'm pleased. If you need more room, get the small bag. Finally a seat bag that I like. Good product. No, I don't work for Banjo Brothers. It's tight in there. But, there are interior pockets for CO2 and tire irons so the tube has nothing rubbing and the hard CO2 won't bang into your seat post because it's snug in the pocket. i like this bag, it ataches well and doesnt come loose.and its the purfect size for a thin tube (700x23) 2 co2 tanks, multi tool and patches.mountain bike riders might want the next size larger for bigger tube storage. Perfect fit on my vintage roadbike! I bought this bag for my restored 1972 ManuFrance road bike to carry a spare tube, a set of vintage tire irons that I bought when I switched over to clincher tires in college, and an old Velox patch kit that has been refilled a dozen times. The Banjo Brothers deluxe seat bag holds all this stuff plus a couple of granola bars. The fit is great, it was easy to install and it looks super! I have one of these bags on all three of my bikes, My TREK Madone, My TREK 7500 hybrid commuter and my Jamis Mtn Bike. I use them for carrying tire emergency gear. Each holds a spare tube, a set of tire levers and a CO2 inflator. There are some nice features too, there is a separate compartment that I use for carrying some $$ and each has a tether with a hook on the end that I use to stash a spare house key. They are well made and durable, easy to install and well worth the $$. The medium works well for the two street bikes, the Mtn Bike tube is a bit bulky (26X2.2) and required a step up to the larger size. 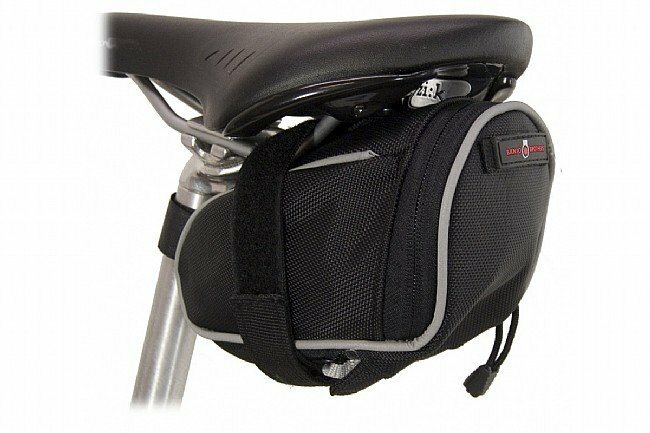 I needed a new seatbag that could hold roadbiking essential and this works great. It holds a spare tube, a patch kit, an inflator, a few CO2 cartridges and a compact too. Plus it's reflective and has a loop on it to hold a blinking rear light for dusk rides. Smaller than I expected, barely able to hold a spare tube, levers, CO2 cartridges, wallet, and cell phone. I use it to hold identification, cell phone, and what I need to replace a tube (tube, levers, CO2 cartridges). It can hold those things, but not readily or easily. Perfect size for 2 tubes and a few small tools. My last one was a bit too small but this is roomier. Seems high quality. This Banjo Brothers Deluxe Seat Bag puts the finishing touches on my bike build. Spare tube, crank brothers multi tool and two Co2 cartridges all fit with a little room to spare.